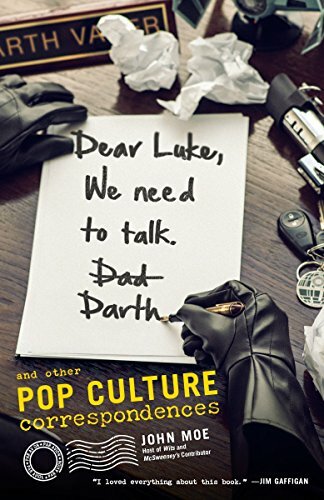 Sometimes it’s a book title that draws me in, and that was definitely the case for today’s book: Dear Luke, We Need To Talk, Darth – and Other Pop Culture Correspondences by John Moe. It’s rather a long title, but it does pretty much encapsulate the book–a series of letters, interview transcripts and journals, putting a new slant on familiar movies, TV shows and songs. Like anything based on pop culture, these only really work if you know the originals–but Moe seems to have chosen things that are very widely known, if I can judge from my own experience. I had at least heard of everything that was spoofed, and had some idea of where the jokes were originating. The book satirizes a broad range, from Jaws (the therapy journal of the shark), to Elvis (a letter from his severely depressed hound dog), to Harry Potter (the diary of an obscure student) to the Grinch (a disgruntled letter from Max). There’s a lot that’s funny in here, although, as may be inevitable with this kind of structure, I did find the book ultimately hit-and-miss. Some portions were very clever and funny; in other places, I thought the book went for the cheap joke or profanity punchline more than was really necessary. I’ll grant, however, that humor is highly subjective. I like my humor witty and clever. Fans of, say, Will Ferrell or Adam Sandler might love the same jokes that didn’t appeal to me. – Oral history of the Pac-Man ghosts, pellet-farmers who won’t let death (or Pac-Man) interfere with their work. – A letter to Billy, the “Piano Man,” from his manager, asking him to please stop singing about guests at the bar, because it’s awkward. – A letter from the Peanuts kids’ teacher, who’s concerned that she’s never met any of her students’ parents (but delighted that the kids can understand her despite her speech impediment). – Letters home from a professional henchman as he cycles through employment with various supervillains. Disclosure: I received a copy of this book for free from Blogging for Books, in exchange for an honest review. Sounds humorous, but I can see where it could be hit or miss. I think I’ll see if the library has it. I want to read the Hotel California one, and Max’s letter from the Grinch, as well as the Star Wars and Harry Potter-type stuff. This sounds like a really fun and funny read. The author seems to have chosen well-known cultural touchstones. Just your summary of a few of them brought a smile. Will have to check it out!